AdSeal Services Inc. is a locally owned company specializing in both waterproofing and coating applications. You will find our applications within many of the institutions, commercial buildings and public structures throughout the Ottawa region; such as bridges, water treatment plants, public and separate schools, parking lots, underground garages and many federal buildings including Parliament Hills. We are affiliated with several concrete companies who complete the poured foundations of many residential homes, townhouses and apartment buildings in the Ottawa-Kingston region; of which we provide the specified water-proofing and damp-proofing to protect these new homes and buildings. Adseal are approved certified installers for many of the largest manufacturers; whose products are the most dependable in the industry. 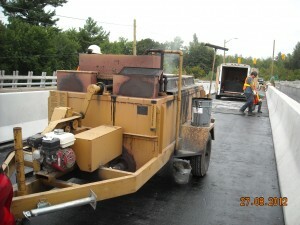 Adseal also works closely with our clients to schedule and coordinating smooth transitions on projects. Adseal draws resources from our product manufacturer contacts and expert consultants to find the appropriate water-proofing solutions for our clients. Adseal’s service, experience and expertise are second to none. We have the capacity and the staff to handle almost any scale of project. Our team of knowledgeable professionals is highly trained and dedicated to our profession.